The more effective the muzzle brake is at combating recoil means the more punishing the surrounding concussive blast is. In the accompanying high speed photograph you can see the concussive blast pattern affecting a near 360 degree arc around the shooter. This leads to range buddies not wanting you to shoot with you, spouses and children who no longer want to shoot with you, and generally being shunned by those near you on the range, let alone on your entry team or in any other tactical situation. Designed to fit over any 1" or smaller outside diameter muzzle device, the BFD takes the exhaust from the muzzle device and directs it downrange after it has done its duty in reducing recoil. The high speed photo with the ICD BFD installed shows this quite clearly. 1. What size BFD Mount do I need? 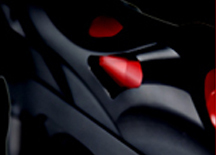 The BFD Mount size is driven solely by your muzzle thread outside diameter. If you have 1/2" -28 tpi muzzle threads (1/2" OD thread diameter, 28 threads per inch) for example, you need the 1/2" BFD Mount. The "threads per inch" do not matter as the BFD Mount does NOT thread on, it simply centers over the muzzle threads, which is why "size" does matter. .
We describe the BFD Mount sizes in inches and millimeters on the website to help with this determination and are very happy to answer questions sent in to us regarding sizing, but will need to know the manufacturer, the model, and the caliber at a minimum to properly advise on sizing. 2. What length BFD should I get? The BFD offers 2.25" of brake coverage while the BFD XL offers 3" of coverage. Various brakes that are over 2.25" will work fine with the BFD, but for aesthetic reasons some shooters prefer the brake be fully covered. The BFD XL was designed to work with longer brakes, those in the 2.5" - 3" range. You can use either size with no adverse effects, but the proper length matched with a specific length brake will give better control of the concussive forces and still allow the brake to function properly to mitigate recoil (ie - a 2.00" long brake in a BFD XL will not control recoil as well as with the original BFD). 3. Why isn't a Thread Protector included? The BFD Thread protector is NOT included with the BFD or BFD-XL from our shop, but some distributors sell it included. We do NOT include it as often the Thread Protector isn't needed or cannot be used. This occurs most often when the length of the hand guard and the length of the barrel are closely matched, so the BFD threads are "protected" by the hand guard itself. There are also instances where there isn't enough room inside the hand guard to get your fingers on the Thread Protector off the BFD Mount (ask us how we know this...) We have a "fit guide" we can send you if you are concerned about clearance issues or whether or not the Thread Protector will fit. 4. What muzzle brakes work best in the BFD? We try not to recommend any specific brake or muzzle device from any manufacturers as there are so many excellent devices out there, but our testing (10,000+ rounds downrange) shows that a device that is even with or shorter than the end of the BFD and with a diameter closer to 0.825-0.850" works better than something longer or larger in OD. 5. Will the BFD eliminate my brakes ability to control recoil? We have tested numerous brakes (over 35 of the most popular selling brakes available) and have found that within the BFD Tube the recoil impulse control is similar to without the BFD Tube in place. A "bad" brake still doesn't work and a good brake still does, despite what many closet physicists will assert on the interwebz. The level of recoil reduction is typically reduced by an average of 5-15%, with the best performance inside the BFD coming from brakes that are smaller in outside diameter (ie - one with 0.825" O.D. works better than one at 0.985" O.D.) as there is more room to evacuate the gasses. 6. Will the BFD work on a pinned and welded brake? It will, but of course the muzzle device will need to be removed and re-pinned/welded after the BFD Mount is attached. 7. Is the BFD legal in my state? Check your local laws regarding any muzzle devices as some states do have some restrictions that defy logic and we cannot keep up with each one. There are no restrictions of any kind on our blast forwarding device that we are aware of, but the responsible owner of a firearm should be familiar with any laws they are subject to following that may pertain to their specific equipment choices. 8. Can you make a custom BFD? 9. What size barrel O.D. will the BFD fit on? The BFD is sized to fit over up to a 0.778" diameter barrel. This takes care of most every diameter on which someone is likely to use the BFD, from pencil profiles up through standard M4 and beyond. The minor gap at the rear of the mount from the smaller O.D. of a pencil profile/contour barrel at ~0.630" versus the BFD Mount at 0.778" does leave a roughly dime sized gap. This is virtually invisible to the eye, especially if the barrel is black, and does NOT affect the fit nor function of the BFD. 10. Will the BFD fit under my hand guard/rail? The BFD is sized at 1.49" OD for the BFD tube itself, but due to the unique mounting system and the form factor of the unit tapering at the rear (breech side) it will fit in many more applications that one would perhaps think it may not. If you have any potential fit issues feel free to email gary@icdproducts.com with hand guard ID (internal diameter), hand guard length, barrel length, and the distance from the breech end of the barrel threads to the hand guard (for example: 9" 1.38" ID hand guard, 9.5" barrel, breech end of threads 1/8" inside hand guard.... or 1.25" ID hand guard 9" long, 10.5" barrel, breech end of threads 0.5" forward of hand guard). In addition to our branded product lines, we offer contract manufacturing services. 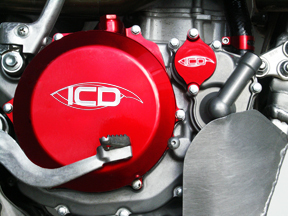 ICD has a highly trained, creative staff that can assist in the design, prototyping, production, and assembly processes. ICD is committed to quality and excellence in every function and department. ICD offers a manufacturer's warranty on every item produced. Out extensive supplier and finishing network enables the company to have short lead times. Please contact our consultants for more information. Indian Creek Design, Inc. is a family-owned business with three generations of manufacturing experience. ICD has designed and manufactured a variety of consumer products for a myriad of industries. ICD specializes in CNC precision machining of many materials, including exotic plastics and composites. Our products are made in the U.S.A.
Or on Facebook @ Indian Creek Design, Inc.